Brighton quartet LibraLibra have revealed a nostalgic new video for their latest single ‘Loverboy’—released 5th April 2019—inspired by ‘90s “secret admirer board game” Dream Phone. Four renegades from the open-minded and multicultural seaside town of Brighton, UK, LibraLibra are the kind of band that embody the free spirit of their hometown. Off-the-wall melodies akin to Asha Bhosle, frenetic lyrical flows that would leave MIA burned, and the range of Mike Patton—all thrown together with playground chants, world music rhythms and broken, distorted guitars—make theirs a riotously unique and colourful collision of styles. There’s an unease at the core of each of their songs that leaves the listener hanging on to vocalist Beth Cannon’s every inflection, each new chorus cementing the ambition and talent of this intriguing bunch. 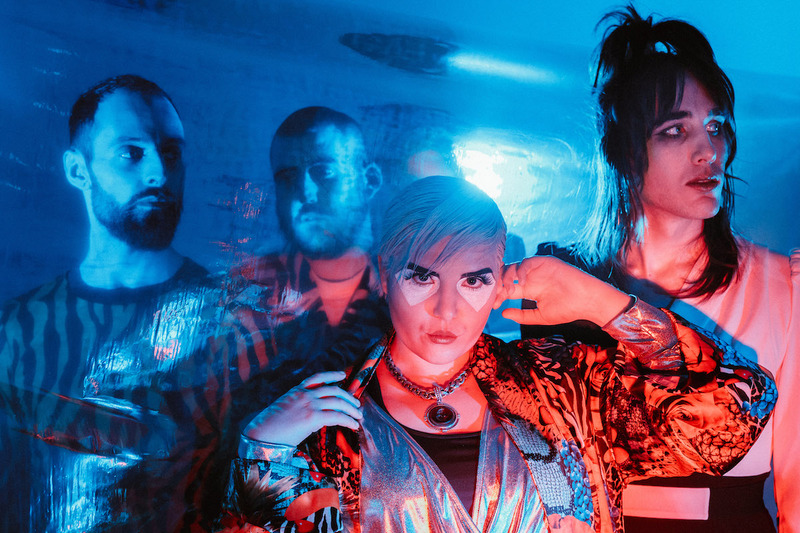 Their escapades across the last year have pricked up important ears all over the place, leading them to work with Idles’ producer SPACE on their new single, ‘Loverboy’. ‘Loverboy’ builds on LibraLibra’s first three singles ‘Animali’, ‘Tongues’ and ‘Skin and Bone’ which gained heavy support including BBC Introducing, Amazing Radio, Radio X, The 405, Les InRocks and Get In Her Ears. The palpable early buzz on the band has been further stoked by recent live dates including appearances at Liverpool Sound City, the Great Escape, Bad Pond festival, Off the Record and London support for the mighty Psychic TV at a sold-out Heaven. A busy 2019 live schedule is shaping up, including ‘Loverboy’ single launch shows in April—continuing their penchant for multi-dimensional, immersive live gigs, this time they will be luring their audience into a high school prom. Cannon’s vocal ability has received deserved accolade throughout her career with her command of script prompting comparisons to Kate Bush and Björk. Some may recognise her voice from Simon Raymonde’s Lost Horizons (Bella Union), where Cannon wrote and performed on lead track ‘Bones’ and fronted the band throughout a summer of festivals including Green Man, End of the Road, Seachange, Kendal Calling, Bluedot and many more. While her powerful presence is unmistakable in everything she does, LibraLibra is a different beast, and really showcases the direction Cannon is heading in, which is ultimately down along a more dark and twisted path. Fans of the B52s, The Knife and Fever Ray will find themselves in exciting new territory here. ‘Loverboy’ is LibraLibra’s fourth release and will be available across all streaming platforms from 5th April. Mixed and arranged by SPACE (Idles/Black Futures) and mastered by John Davis at Metropolis.